ADDL’s Molecular Diagnostics team includes: (front row, left-right) Scott Gentry, molecular/virology laboratory technician, and Eric Pouliot, molecular laboratory technician; (back row, left-right) Krista Huff, undergraduate researcher; Mijana Beckett, molecular laboratory technician; Farren Osborn, molecular laboratory technician; Dr. Rebecca Wilkes, section head for molecular diagnostics; Angela Chan, molecular diagnostics development supervisor; Velina Lindley, molecular diagnostics operations supervisor; and Brianna Trent, undergraduate researcher. 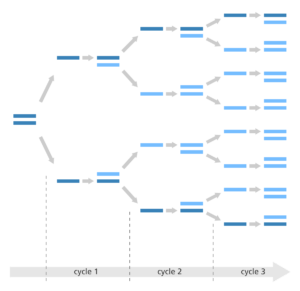 Polymerase chain reaction is a biotechnological technique used in advanced medical diagnostics. The testing method, commonly known as PCR, also represents one of the fastest-growing areas of the modern veterinary diagnostic lab, including the Indiana Animal Disease Diagnostic Laboratory (ADDL) at the Purdue University College of Veterinary Medicine. PCR uses molecular biology to amplify a segment of DNA and generate thousands of copies of these DNA sequences in a bulk mixture. Through a series of mixtures with strategic binders called primers and thermal cycling, PCR reveals the presence of an infectious disease, or lack thereof. In her new position as head of the ADDL’s molecular diagnostics section, Dr. Rebecca Wilkes, Purdue Veterinary Medicine assistant professor of molecular diagnostics, plans to expand PCR testing by adding new tests and equipment and developing more panel tests that screen for multiple diseases with a single sample. 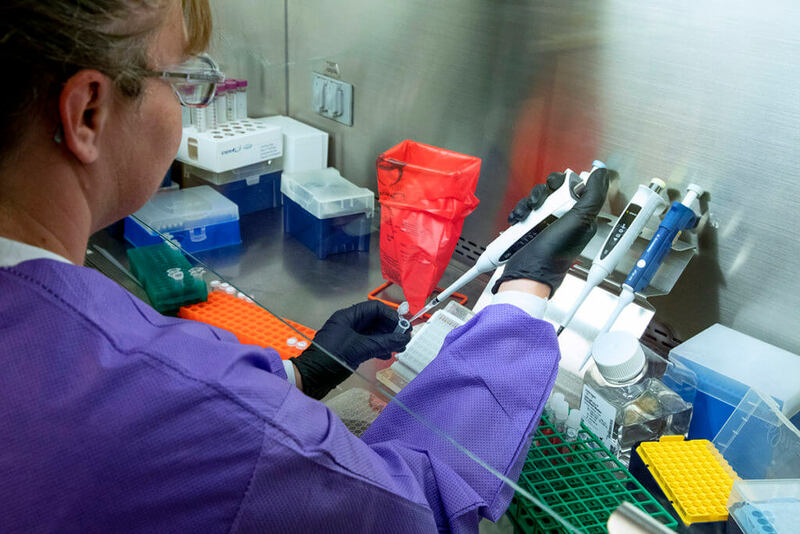 “We see so many benefits to using PCR for diagnostics and would like to see more accessions for equine and small animal testing in the near future,” Dr. Wilkes said. PCR comes with many benefits in diagnostic testing. It can be used to analyze extremely small amounts of samples, new or old. It also is useful for difficult or slow-growing preparations and when a rapid diagnosis is required. ADDL Molecular Diagnostics Operations Supervisor Velina Lindley prepares samples for DNA extraction. As PCR grows in popularity, microbiologists are increasingly developing panel tests to address clinical needs. Tests such as the bovine respiratory panel are designed to rule out or confirm five common diseases in bovine patients. “Our clinicians really appreciate this as an option because it’s fast and can be definitive. We are always willing to add new tests,” said Dr. Wilkes. For a full list of PCR tests, including clinical cost, collection, and shipping information, please refer to the ADDL website: addl.purdue.edu.